Banquettes: How to get the look with a sofa, loveseat or settee. As I’ve mentioned before – I love banquettes. 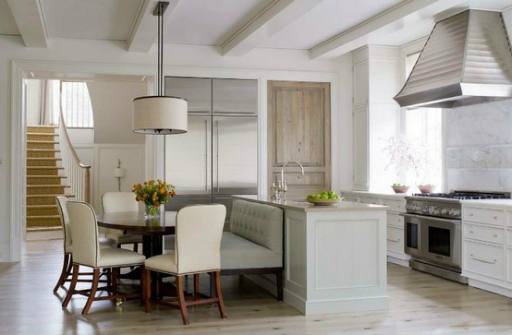 There is something inherently glamorous about a banquette. Or perhaps it’s because I imagine a dinner party of my friends piling onto a big banquette in my dining room. I can’t quite put my finger on the source of this love, but it’s there. Oh, it’s there. Banquettes are often thought of as built-in, such as this dramatic gem of a dining room via Toby Fairly. These built-ins can be a great solution to a tricky area. However, the look and feel of a banquette can be easily achieved by pulling a sofa, loveseat, settee or bench up to your table, without the expense and construction mess of a custom built-in. Allow me to explain… visually. A sofa fits perfectly between cabinets in a kitchen nook. via House Beautiful, February 2012 issue. Another perfectly sized sofa. This one features a beautifully shaped back and another favorite: nailheads. Source unknown. A very simple sofa becomes more interesting as a banquette. Source unknown. This dramatic settee makes a big statement in this otherwise understated dining room. source unknown. A punch of pink pattern brightens up this kitchen with the sofa turned banquette. Source unknown. This clever Kitchen design features an armless sofa as banquette with a table where many others would have used bar stools. I love the originality and out of the box thinking! Source unknown. An elegant sofa creates a contrast to the more rustic dining table in this interior design. The effect is stunning. via Four Walls and a Roof. The Interior Designer of this hotel went big and bold. This space features a large, curvy hot pink sofa as banquette. Wow. via Ohmygosh! Design. I wanted to add a built-in banquette to my dining room. However, the location of light switches and the air-intake vent make that project well beyond my budget. No problem – I now have my eye on a settee that I want to include. Stay tuned for more! Do you love banquettes? 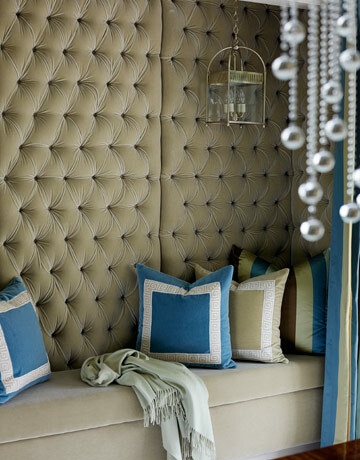 Check out my collection of banquette inspiration on Pinterest. Do you have a banquette? I’m jealous and would love to see it! Please share photos with us on Facebook.